Fern discovers that she was swapped at birth and leaves her tragically dull parents for an unforgettable adventure with her true father, the Bone. Just who are the Anybodies? You'll have to read to find out! 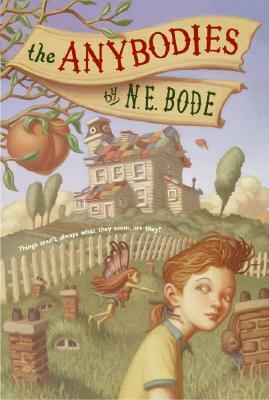 Narrated by the hilariously intrusive N. E. Bode, The Anybodies is a magical adventure for readers of all ages. The elusive and charming N. E. Bode writes from a secret locale beneath a giant, unmarked tree in the middle of Central Park. Some great works born from this hidden perch include The Anybodies, The Nobodies, and The Somebodies. N. E. Bode would also like to mention the books of Julianna Baggott, trusted friend, who writes novels and poetry for grown-ups and lives in the Florida panhandle. Peter Ferguson, who did the illustrations for this book, is a disagreeable young man who lurks in a dusty corner of the hamlet Montreal, not far from the Arctic Circle. His favorite phrase is "You can't make me."